If a certain practice increased with 29 per cent in a month, you’d be a fool to ignore it. Recent research from Pew Internet indicates that an increasing percentage of the online population is using RSS readers. So I thought I’d take a closer look at the adoption rate for Swedish media with RSS feeds by studying the increase in subscribers in Bloglines (who has about a third of the aggregator market, so the numbers could indicate where the market is heading). During a one month period (Dec 9, 2004 and Jan 11, 2005) we see that the average increase in number of subscribers in Bloglines is 29 per cent. 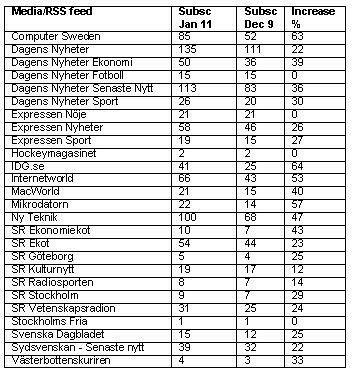 Some RSS feeds have seen a much higher increase, like IT publication Computer Sweden, while others haven’t gotten any new fans. Sure, this is from very low numbers (Hockeymagasinet has 2 subscribers) and I wouldn’t read too much into it, but the trend is indeed very positive. Imagine how it will look in a year from now, at the end of 2005 which I predict will be the year of RSS.